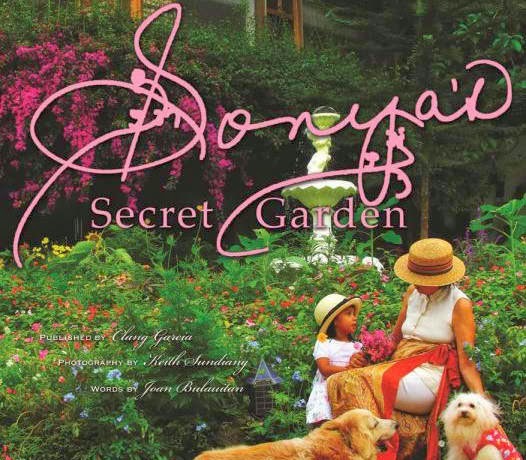 Sonya's Coffee Table Book entitled "Sonya's Secret Garden" ~ Takes you to her private sanctuary in beautiful photos, a way of inviting the readers to her home. 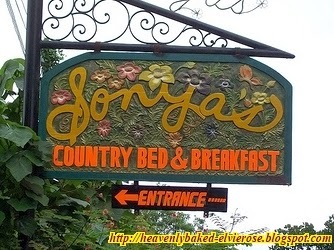 Nestling in the cool paradise-like place in the south called "Tagaytay City," Sonya's Garden is Sonya Garcia's private sanctuary until she decided to open its door to the public. It offers a romantic nature garden dining and lodging. What to expect when you go to this place includes : Greenhouse restaurants which serves organic gourmet meals, the bed and breakfast cottages surrounded by charming gardens, the sensuous spa to pamper the guests, freshly baked breads and pastries from their bakery called "Panaderia"," the Country Store which sells fresh organic vegetables, herbal plants, hand-painted silk stuffs, embroidered linens, hand-made wares and you can also find Sonya's furniture lines in the "Favorite Finds." Freshly harvested arugula and lettuce topped with mango, eggs, broad beans, cucumber, jack fruit, pineapple, edible flowers drizzled with Sonya’s Secret Dressing or Balsamic Vinegar/extra virgin olive oil. Freshly baked sesame bread with various toppings and dips ~ mushroom pate, bruschetta tomato toppings, anchovies, white cheese, basil pesto, fresh green peppercorn in olive oil, and black olive tapenade. This black horse statue seems to invite guests to visit Sonya's furniture lines in the "Favorite Finds"
Sonya's Furniture Lines at the "Favorite Finds"
Thanks Dina Bella (http://dina-bella.blogspot.com) for commenting on my blog !